The first thing you notice about WANE's Mark Mellinger is how much he looks the part of a news anchor: dark suit, sharply knotted tie, hair firmly in place. In fact, the only thing that doesn't quite fit is his youthful face, but there's not much he can do about that. After all, he's only 30. If you thought Mellinger was older, that's probably because he’s been appearing on local airwaves since 1998, having started out as a fresh-faced reporter for NewsChannel 15 more than eight years ago. Even then, at age 21, he was already a veteran of the news business. He began his broadcast journalism career in earnest while still in high school, beating out several thousand students for a spot on Oklahoma City ABC affiliate KOCO's Student News Corps, which meant helping to produce and co-anchor a daily education segment for the morning news. Mellinger describes the year and a half he spent doing that as "an amazing opportunity to break into the business, really, at 16 years old, in a top 50 market, going on TV [and] reading news, writing news, every day." He dreamed of becoming a sportscaster, and hoped his stint in the Student News Corps would be the first step toward that goal. "I was not a great athlete," Mellinger recalls. "I knew I wasn't going to make it as [a professional] athlete, so I wanted to be around sports in some capacity, and I thought sportscasting looked cool." But Mellinger's KOCO colleagues informed him that he was facing some tough odds. "My news director told me that sportscasting was what everybody wants to do," he recounts. "She got more tapes for sportscasting than anything else." She also told Mellinger that the trend in the business was to hire women and minorities for sports positions. "She thought, as a white guy, I would be best served to pursue news," he explains. "There are more positions available and newscasters generally make considerably more money than sportscasters." So Mellinger put his dreams of calling Chicago Cubs games on hold and turned his attention to news. His family moved to Columbus, Indiana, and he took a job as a news photographer for WBC-TV, a small cable station that did a local 5:30 PM newscast. "[Being behind the camera] gave me great respect and appreciation for the people that we work with: the news photographers," Mellinger says. "They're so important to our business and often an overlooked part of our business, but without them, none of this happens." Soon enough, he was anchoring WBC's 5:30 newscast as well as serving as news director at a radio station in town, but he wanted more, so he left Columbus to become the weekend assignment editor at WISH-TV in Indianapolis. Like his job as a news photographer, Mellinger was glad to gain some experience in another behind-the-scenes position, but knew fairly quickly that he didn’t want to do it forever. "[Assignment editor is] kind of a thankless job, but it's so vital, so I have great admiration for the people who do it. That's the information center of the newsroom. Without the assignment editor, crews don't know where to go. You have to be the information person -- the go-to guy -- for what's going on in the world and in your community." Again, Mellinger parlayed his job into an opportunity to get in front of the camera "[WISH] let me do some fill-in sportscasting and some fill-in reporting, but I knew I wanted to be on-air fulltime." 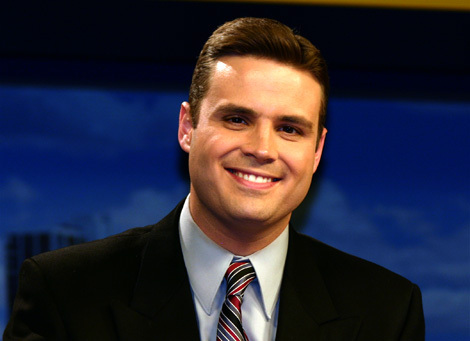 So when a reporter position opened up in Fort Wayne at WISH-TV's sister station, WANE-TV, Mellinger jumped at the chance. 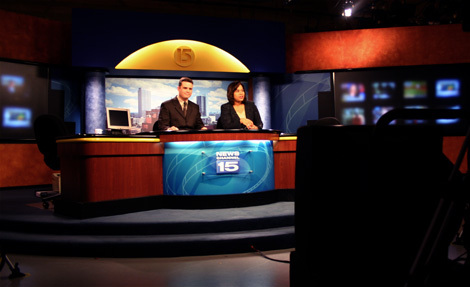 Ten months later, WANE's weekend anchor team of Scott Kline and Julia Moffit was promoted to the five o'clock news and Mellinger was selected to fill Kline's anchor spot. 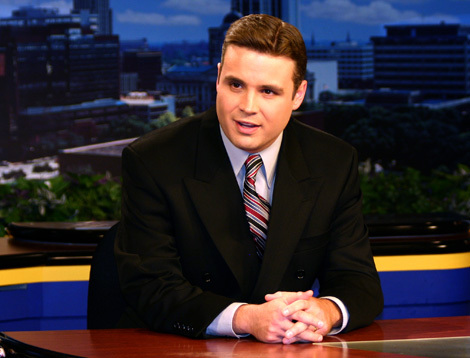 He worked the weekend beat for three years (while also reporting during the week), and then was promoted to the morning and midday anchor seat, where he's been now for over five years. Mellinger also helps oversee WANE's political coverage, anchoring election reports, moderating debates and interviewing prominent political figures. Get him talking about politics and it's pretty clear that he wasn't one of those kids who slept through his high school government class. "Documents like the Declaration of Independence and the Constitution still astound me because of their eloquence in (implicitly and explicitly) honoring and acknowledging God, creating a government that is answerable to ‘the people’, and creating a government where the different branches check each other because of our founding fathers’ realistic view of human nature, especially the potential for corruption that comes with power." Mellinger doesn’t just enjoy moderating debates – he says he considers it an "honor" to give people the opportunity to hear the candidates’ positions on important issues. “When more people are sufficiently informed about who they’re electing," he says, "it should theoretically lead to better government." A consultant brought in by WANE a few years ago suggested he read his scripts aloud before going on air, and Mellinger decided to give it a try. Now it's part of his pre-broadcast routine. "I come into the conference room and read over all my scripts out loud to catch any mistakes that I didn't catch on the first pass," he explains, "and hear how the scripts are going to sound when I actually read them out loud." Then he makes last minute changes and is on the air at 5:00, joined by co-anchor Terra Brantley and meteorologist Greg Shoup. Mellinger takes his lunch break after signing off at 7:00 AM, about the time most people are eating breakfast. Then he returns to the station to repeat his pre-show routine all over again for the noon news. Most days, he heads home around 12:30 in the afternoon, giving him the rest of the day to be with his family. He says being able to spend time with them is one of the benefits of working the shift he does. "I do get to spend more time with my wife and kids than most people." The Mellingers have two children, aged five and six. "This is an important time of life to be with them," he says. Mellinger tries to eat dinner around 5 PM and be in bed by six to get eight hours of sleep before he wakes up at 2 AM again for another day of work with the WANE morning team. Shoup, of course, is the most recent addition to the team, joining the station after being let go from his position as chief meteorologist at WISE33 last March. He and nearly 60 other employees were given pink slips when Granite Broadcasting, which had purchased the station, effectively merged it with 21Alive. Even though no one at WANE was directly affected by the dismantling of the WISE news operation, Mellinger said the entire newsroom was in shock after hearing about the layoffs. "I just don't think anybody ever could have ever envisioned it happening, and it was the talk of our newsroom for some time," recounts Mellinger. "We were friends with a lot of the people over there. You run into them a lot [covering the same events], and I think they just felt like they were broadsided -- and they were." Mellinger and his coworkers weren't the only ones emotionally affected by the bloodbath -- Fort Wayne viewers were shocked, too. And angry. They hit back at Granite where it counts: the ratings. 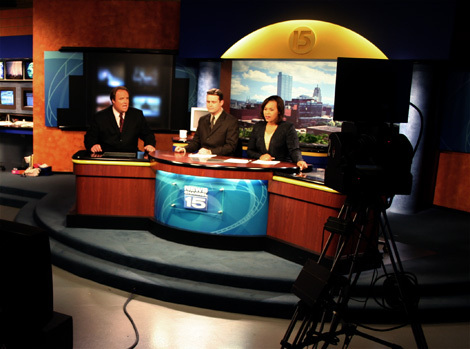 Prior to the merger, 21Alive had consistently finished ahead of NewsChannel 15 and WISE 33. In fact, in the period immediately preceding the merger, 21Alive had some of its highest ratings ever. But after? Their numbers went into a tailspin. WANE leapt into first place and hasn't looked back. Mellinger acknowledges the merger as the main reason for WANE's recent ratings surge, but he says there were also other factors at play. "That acted as a catalyst to grow our ratings," says Mellinger, "but we were in good position to handle that. We had been, I feel, doing better journalism than [channel] 21 or 33 for some time, and I think when you only had one other product to compare channel 15 news to, what it did was it made the differences a lot more stark to the viewer." WANE also smartly added several former WISE staffers, including Shoup, to its operation, no doubt attracting a few former 33 viewers in the process. "I think that that's strengthened our team, having Kelly Koh and Greg Shoup and one of their producers, Scott Murray, over here," says Mellinger. Though the joint 21Alive/WISE33 operation has since been re-branded "Indiana's News Center" and now broadcasts from a new set, they've been unable to make much progress toward reliving their glory days of, say, 2004, when 21Alive was the clear ratings leader. "Our ratings just continue to grow, while theirs either go down or stay about the same," says Mellinger, "and I think that that is a function of condensing the two news sources into one." After more than a year on the job, the ratings suggest that Shoup fits in with the morning team quite well. And that's what Mellinger's hearing as well when he's out in the community. He's often recognized and approached by viewers, and says most of them say more or less the same thing. "Just usually that they like watching the morning news and they like the way we do it, Terra and Greg and me. They think we're a pretty good team." Mellinger says people who come up to him are "almost unfailingly polite," which he credits in part to the fact that he's become a part of their morning routine. "That's one of the nice things about being on the morning show: they feel like they know you." Not everyone who recognizes Mellinger approaches him, but he can usually tell when he's been "spotted." "You can tell that they're talking about you, or I won't catch it but my wife will hear the person talking about it," he says. "To me, that's really one of the nice little bonuses of the job." Mellinger views the fact that people find him approachable as a sign that he's doing something right. "I think if people react to you in that way, that, to some extent, you're doing your job reasonably well, because you're supposed to appear relatable and be relatable when you're on a morning show." And he has little patience for those in the news business who complain about being recognized all the time. "I think that you've got to expect that when you are in front of a camera and talking to people on TV, you're going to get recognized, so I've never understood why people who do what I do say they get annoyed by people who come up to them," he says. "If you think that's going to be that big of a drawback to your life, don't get into [broadcasting]." Of course, broadcasting has changed quite a bit since Mellinger began his career, and continues to evolve. The news business is in the midst of a large transition, and local TV news is no exception. It's something that fascinates Mellinger, and unlike many in his line of work who appear afraid of change, he seems to look forward to it with excitement. Maybe that's because he's not one to obsess over his job security. "The one thing about this business that anybody who gets into it should know is, you could be fired for anything. You could do a great job and work your tail off and be fired for any reason, especially when you're an anchor. So you go into almost expecting to be fired at some point." But assuming Mellinger doesn't get fired any time soon, odds are good that things will be changing around him quite a bit in the next few years. He says he believes WANE is going to do their best to keep up with an evolving news business, and the main way to do that is through their online presence. "I think you have to hit the Internet harder," he says, and goes on to paint a scenario from the NewsChannel 15 newsroom of the future that sounds, quite frankly, like the newsroom of the present in a lot of other places that have already fully embraced the Internet. "Let's say that I'm working on a story for the five and six o'clock news," he postulates. "We may not hold that story until five or six o'clock. We may want to put the information out there on the web before five or six o'clock, because it's all about serving the viewers and especially younger viewers nowadays don't want to wait until five, six, eleven o'clock to get the news. They want to be able to go to the Internet and be able to follow it there in a fluid way." WANE already does a pretty good job of using their website throughout the day to report and update breaking stories, something Mellinger says isn't an accident. "It's driven into our heads -- and has been consistently for the past three or four years -- everybody, whether you're a reporter or not, by the time you've left [the station for the day], you should have put a story on WANE.com. That goes for anchors, producers, whomever." Mellinger says WANE's assistant news director spends a good portion of his time maintaining WANE.com and that the station has a sales person assigned solely to selling advertising on the website. "I wouldn't be surprised if it gets to a point where we will offer some sort of product [on WANE.com], whether you download a newscast or portions of a newscast or create your own newscast and you're able to download it to your cellphone or to your iPod." He says he thinks that kind of thing is "already being investigated" as a way to serve viewers and create a new revenue stream. "They're trying to squeeze revenue out of any avenue we can find," he says. Though Mellinger sees a lot of change up ahead, he's convinced television will remain the primary way WANE reaches its audience for the foreseeable future. "That's our bread and butter, that's going to be our primary way of communicating with people for some time," he says, "but I would predict probably in the next -- maybe not the next two years, but the next five, ten, fifteen -- certainly the next ten or fifteen, I think you'll see us looking to do more in the way of taking advantage of wireless technology and digital technology, and I think you have to." Mellinger is also excited by the archival possibilities of the Internet, something broadcast journalists haven't had the benefit of in the past. "That's one of the frustrations of people who've been in TV news," he says. "You think you've gone out and broken this great story or covered a nuance well that somebody else hadn't really brought up -- now that it's on the Internet and it's in a form that usually involves some hard copy. It's something that someone can go to and check out whenever they want, kind of like the newspaper. Once it's in there, it's there." Making stories available for longer periods of time "does kind of legitimize your reporting more," says Mellinger. And knowing your work will be online as well as on air can serve as a motivator. "You know that people don't just have one or two chances to catch [your work], and, if they miss it, they miss it and that's it. Now that we've got the Internet, your stories hang around longer and have more of a chance to make an impact. " That's especially important to Mellinger now that he's been here long enough to become invested in the community, and it doesn’t sound like he’s planning on leaving anytime soon. "My wife's from Fort Wayne, so I'm not a market-jumper. Her family's here and she likes it here, and I would never go to any other city if it was against her will. You can't, and it's not in your best interest to do that," he advises. "My wife and my kids really like it here and so do I, so we feel like we'll be a part of this community for a long time." He says he’s enjoying what he’s doing but looks forward to trying some new things, too. "I'm extremely happy with what I do now, with the shift I work, but I hope that in the not-too-distant future, I'll be able to take on some new challenges and responsibilities that would continue to stimulate my growth and be beneficial to WANE-TV." Nice article Nathan! I will say that I have been in the business since Mellinger was 10, and I have never met a person that has as much class and honesty as Mark. In this day and age it's difficult to find many people who are as dedicated to honing their craft and getting each story correct like Mark does. He is also one of the most humble and down to earth people you will ever meet. In other words a gentleman in the true sense of the word! Good looks and personal integrity. What a rare combination nowadays! I also enjoy listening to Mark's radio program Saturdays on Bott Radio Network 1090 AM. If WANE TV is smart they'll hang on to this guy! I dated Mark in high school in Columbus, and he was a great guy even back then when he was new in town. It's nice to learn of an old friend's continued success. Just wondered about Mark's parents. We use to live here in Ft. Wayne and went to church with a very nice Mellinger couple who had a son. We moved away and have lost contact, now back in Ft. Wayne and watching Mark on the news we were wondering if it is the same Mellinger family. My favorite Mark Mellinger moment was when he coordinated election coverage and used graphics that called the Democratic party the democrat party. As Frank Luntz would say, "It doesn't get much better than that and that is what I get paid the big bucks for"